As animals get bigger, from tiny shrew to huge blue whale, pulse rates slow down and life spans stretch out longer, conspiring so that the number of heartbeats during an average stay on Earth tends to be roughly the same, around a billion. … the surface area a creature uses to dissipate the heat of the metabolic fires does not grow as fast as its body mass. To see this, consider a mouse as an approximation of a small sphere. As the sphere grows larger, to cat size, the surface area increases along two dimensions but the volume increases along three dimensions. The size of the biological radiator cannot possibly keep up with the size of the metabolic engine. Might be fun to start with the theory that all animals get a billion heartbeats and build up some charts to see if its true. 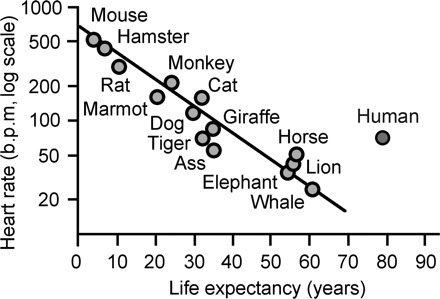 Also a surface area of various mammals vs age graph might be interesting to calculate and plot. Does this mean that I should stop exercising? so , human is an exceptional ? Today’s human looks to be an exception. Humans from 10,000 years ago might fit the billion heartbeats trend a bit better.